While a safety incident can happen in a moment and in any workplace, a moment’s forethought can prevent harm. Safe Work Australia is asking that all workplaces commit to taking a safety moment every day. This could be as simple as spending five minutes every morning talking with your team about the hazards and risks in your workplace, and how to prevent harm. This will be a key message at the Ward Safety Day that is scheduled for Friday October 19th. Ward was pleased to announce that its Macquarie Busways project team took out this month’s WHS award. HSEQ Manager Uday Gorrepati noted a significant improvement in the performance of Task Observations by the project team as a reason for the award. 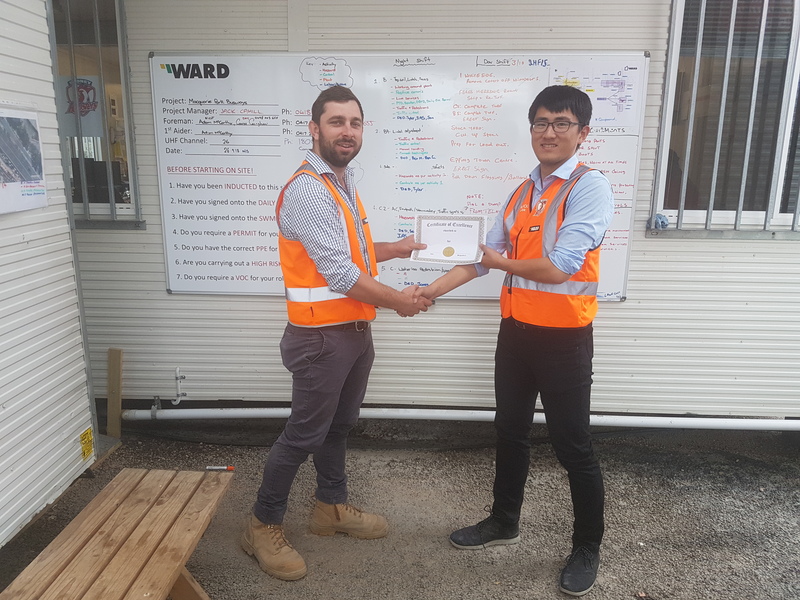 “At Ward we set a target for each team member to compare the performance of a high risk activity against the relevant Safe Work Method Statement for compliance, at least once a week.” noted Uday when presenting the award to PM Jack Cahill. “We use these Task Observations as a lead WHS indicator in the measurement of our WHS performance across the business. It is pleasing to see that Jack and his team taking the lead with this critical work. It is part of building a culture in the business that is focused on preventing harm”.